The entry way is the first impression in your home. And for our home, it is also one of those super awkward spaces that can easily become the area left to it’s own devices. We have a very narrow 2 story entry way that opens to the dining room, living room, and parlor/future drop off area. There is also a small balcony that makes for a grand feeling, even if this area is very difficult to photograph. 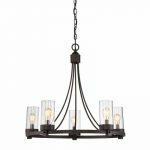 Since the day we moved in, we have wanted to replace the very basic and all-wrong chandelier in here, but finding a lighting option that fit in the space was a challenge, and I am sharing what we learned about how to choose the best lighting for an awkward space like this. 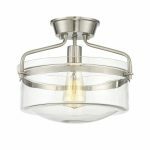 First, lighting rules will depend on whether a lighting fixture is being placed over a table or not. 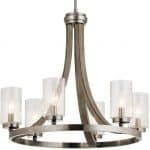 For a table, the fixture’s diameter (length) should be 1/2 to 2/3 the width of the table. 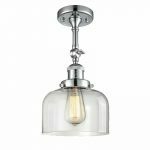 It also looks best if the overall shape of the fixture mirrors that of the table. 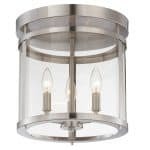 For example, a long rectangular table goes best with a rectangular lighting fixture. 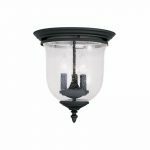 The light should be about 30-35 inches between the table top and the bottom of the fixture. Secondly, the fixture should be proportionately scaled to the space. Start by measuring your room and converting the measurements from feet to inches and add them together. For example, our living room is 16.5×25 feet. So, the diamter of our light should be about 16.5+25=41.5 inches (our ceiling fan is 42″). Also, take into account the overall shape of the space. Two story foyer’s can be problematic, but since it is very tall and narrow, a light that is also tall and narrow is best. Quick Tip: If you still aren’t sure, the best advice is to cut out a large piece of paper in the dimensions of the light you are considering and hang it. This will give you a great visual aid to see how the light will fit in the space. 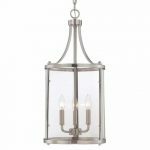 After a lot of debate, we chose this Hudson Cage Lantern because it fits so well in the space and it is an affordable and stylish option. 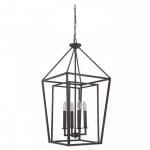 The best part about this particular lantern is that it doesn’t have any glass to clean! 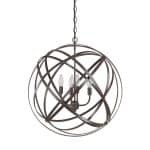 Cleaning our former light fixture was always a pain because we had to swing it over the balcony and a second person had to hold it. One wrong swing and wooosh! we could have broken the arched front window. 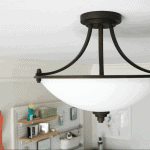 With a simple duster on an extension pole, this light is much easier to maintain. 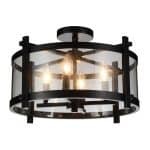 One of the big problems that we ran into was that a decent sized stylish foyer light can easily cost upwards of almost $800-$1,000 or even more. 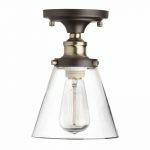 So I have rounded up a few of my favorite entryway lighting choices that are under $300. I also included a few higher budget options, because they are just that stunning. I couldn’t help it. 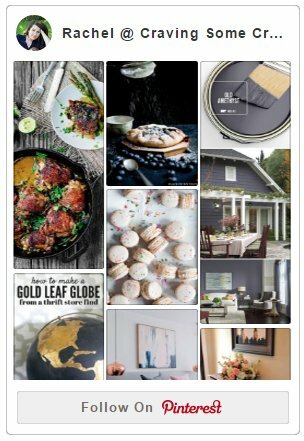 While not everyone may have a 2 story entry way or foyer, I got you covered there too! 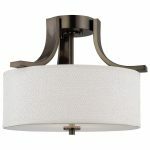 I have also included some beautiful and unique semi-flush mount ideas. 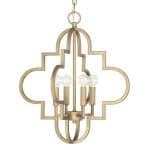 Being in the hunt for the perfect light took us 2 years, but I love our beautiful new light. If I could take home one of each of these, I certainly would though. Love the light you Chose! Would you mind sharing which size you purchased? Glad you like it! For my narrow foyer, I chose the 15×32 size. That was the closest to the calculations for proportion in the post. Thank you for sharing the tips!! The new light looks so great!! I love the lights you shared, so unique, but I think the one you chose is the best, I like it the most. Thank you! It is a huge improvement over the old one we had. We have an awkward foyer area also that really needs a new light fixture. I don’t know why that area always gets overlooked in my house. Pinning for future reference! It looks beautiful! Thank you for your tips, especially cutting out paper in the shape of the light.